Karimun Island, also known as Karimunjawa and Karimun Java, is a hidden paradise of Java, is an archipelago of 27 islands north of Semarang and off the coast of Central Java. 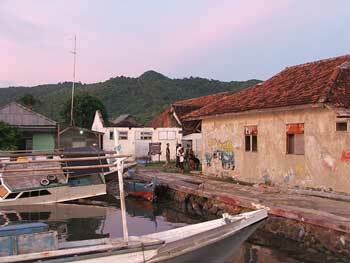 The main island is Karimun and the second island is Kemujan. 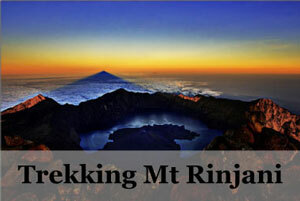 The two islands are like twins, just side by side and often mistaken one of another. 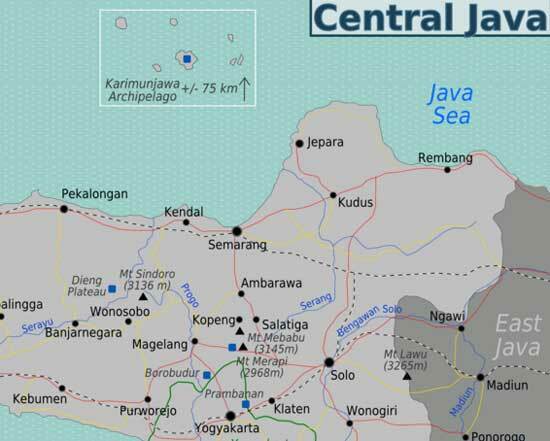 Karimunjawa name literally means a stone’s throw from Java in Javanese. This place is well known by savvy travelers of Java that would like to find some beautiful beaches and sea without needing to leave to other parts of Indonesia. Many locals will also introduce you to this place, the pride of Central Java for having their very own white sand beaches and clear blue sea. 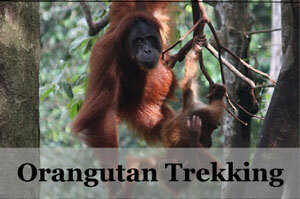 Karimunjawa islands are about 80 km northwest of Jepara, a small town in Central Java. 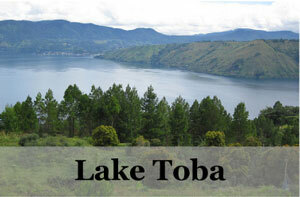 It can be reached by a ferry boat from Kartini Port in Jepara for about 3 hours. A beautiful sea getaway from the hustle and bustle of the inland of Java, though Java mainland does bring a lot of charms, this is the answer to your cravings for sun, sea and sand. Also this place is not swarmed with tourists yet unlike the famous Bali of Indonesia. 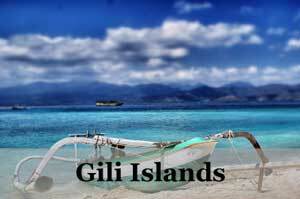 Therefore you can find yourself enjoying the serenity of secluded and tranquil white beaches. 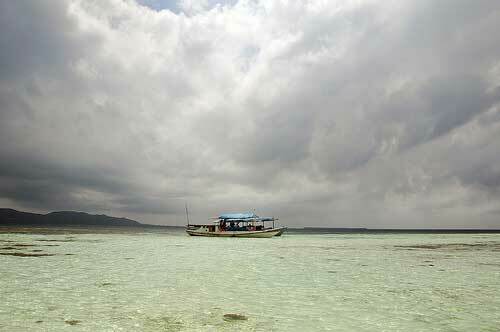 Travelers come here to have a fix of snorkelling or diving as well, where the coral reefs are well protected. 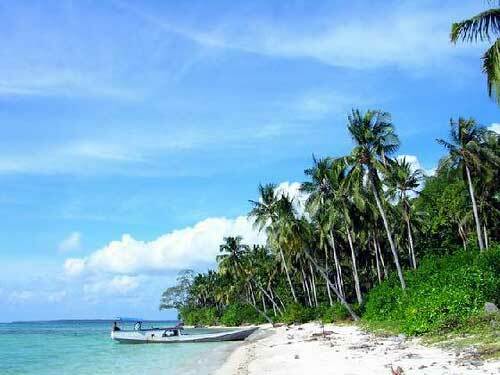 As the rest of Java, Indonesia of a tropical climate, the best time to go Karimunjawa would be during the dry season of April to October where the weather would be consistent sunny but humid. Island hopping for snorkelingRent a boat and go hopping from one island to another, exploring the sea and the beaches as you go. 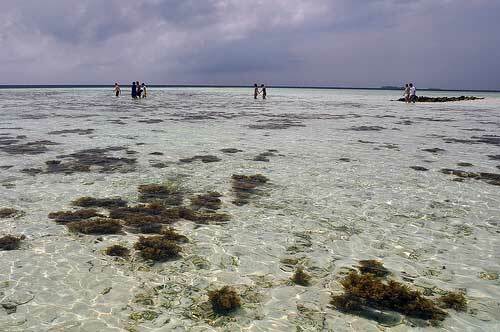 Snorkelling is a must here where the corals are aplenty and the sea clear and blue. There are many small islands to explore, the popular ones being Pulau Tengah, Tanjung Gelam and Menjangan Besar (touted most beautiful). Having 35 types of corals, sponges, mixtures of fringing and barrier with depths of 15 to 40 meters, Karimunjawa can be another diving haven, where you can meet a large variety of marine life and even shipwrecks. 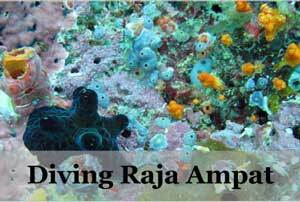 Good local diving spots here are Taka Panyawangan and Gosong Cemara. Many sharks have been sighted around the Karimunjawa islands and if you are into adrenaline rush, go to Menjangan island and try to find some sharks to swim with. The guides will ensure your safety so do not worry. Another interesting thing to do here in Karimunjawa is to go fishing. You can rent a boat and go out to the various good fishing spots nearby to catch some lunch or dinner and finish it off with fresh coconut found easily around the islands. Ask the locals and hike or trek around, you may just find yourself from places with a beautiful panoramic view of the islands and the sea. 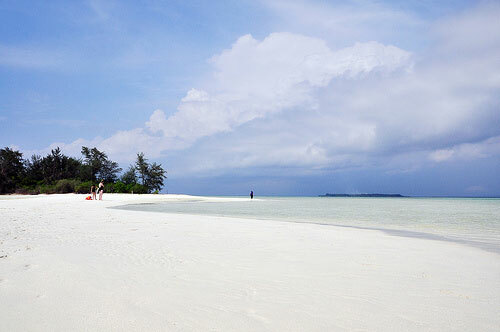 Being one of the best beaches in Java, Indonesia, Karimunjawa is not short of places to stay *. If you are looking for your own private beach and exclusivity, this hotel is the one for you on Karimunjawa Island. This is a real hideaway with amazing views over the ocean and horizon from your rooms. This specialty lodgings are top rated by independent travelers to this island. Quickly booked out, this hill-top hotel is well known for its friendly service and stunning views. If you are on a budget, this friendly and bright guesthouse is the one. Designed with traditional Indonesian motives mixed into modern clean rooms, this hotel is also well located with walking distance to the night fish market. From Semarang, take a bus to Jepara town, which takes about 2 hours. Then from Jepara take a ferry boat from the port. The fast ferry will take 1 hour 45 minutes at the cost of 70,000 Rp and it departs from Jepara every Monday, Tuesday, Friday and Saturday. And if you are feeling in a pinch and having a lot of time on your hands, you can take the 6 hours slow ferry boat that goes off on Monday, Wednesday and Saturday. If you have money to spare and tight on time, you can actually charter a flight from Semarang to Dewandaru Airport in Kemujan Island. 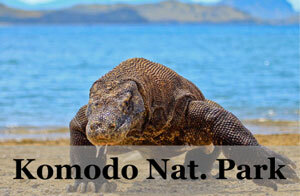 On islands itself, as they are relatively small, you can walk around on foot or rent a motorbike to go around. 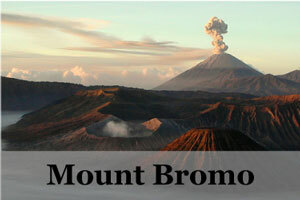 Yogyakarta – Springboard to Borobudur and Prambanan temples. Don’t forget your sunblock, this place can be burning hot! Sunglasses and sun hat are good additions too! 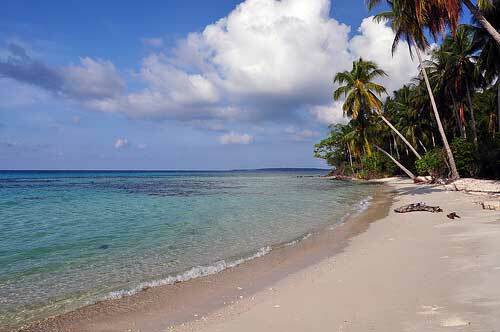 I want to dive on Karimunjawa, but cannot afford to stay at Kura Kura. Can you recommend other places where I can stay and dive?